Literature │ Life is a metaphor, but what does that mean? We know that life is multilayered. When we believe we’ve just lifted a layer, dealt with it and understood it, we only expose the next. But what do we do with the next layer? Will that new tissue, new exposed specimen just be the beginning of many more to come after that? But most importantly, will everything make sense at the end of it all? Murakami’s fusion of magical realism and metaphysical questioning sends the reader falling from a dizzying height. He infiltrates the things that we as humans desperately try to keep a hold of, such as reality, dreams and memory; everything is desperately trying to work as one, to be in harmony if you will. It’s almost hard to believe that in 1974, Murakami was watching a baseball match when he felt the inspiration to write his first novel. Whatever it was that flickered through his mind or suddenly switched on, it never switched off. Murakami’s Kafka on the Shore is the story of a fifteen year old runaway who calls himself Kafka, and an elderly gentleman called Nakata. 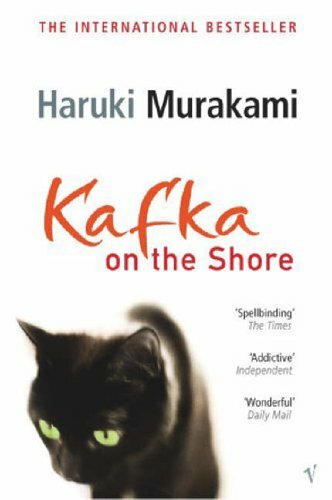 Kafka is trying to run away from his father’s Oedipal prophecy and goes in search of his mother and sister who left him behind, whilst Nakata who can not read or write but is able to communicate with cat’s follows his own fate. That is what this story is essentially about. Kafka is trying to fight a fate that has been laid out for him, unlike others, he can see the puppet strings just like every single Greek tragedy ever written, but Nakata who may not be the sharpest tool in the box, is more in touch with the very being of the earth which will help him fulfill his fate. Understanding and not understanding are key elements throughout, this may seem inconspicuously simple, but nothing is what it seems. As the blur between reality and the surreal continues to swell and merge into the other the more everything strangely makes sense. Fairytale like characters terrify and mystify the reader at every turn in this bildungsroman tale; where libraries are safe houses and forests are gateways to truths. Orphaned children, lost mothers and adopted family and friends are only the beginning to Murakami’s fantastically spun out tale. This multifunctional novel takes us away from the realm we forage in, yet it looks just like the one we step out into every day, but how does he do this? How can he reach into our craniums and change the physicality of our brain? This very questioning is what makes him a successful writer. As a writer, I would like to reach out and delve into the brain of Murakami in order to experience his thoughts and see how he does, I’m sure that it would be a truly out of the world experience. A dark and mysterious one. Kafka on the Shore is the book for younger people who do not mind metaphysical tendencies in literature. It is for people with imagination who like to think on and "digest" a book for some time after reading it. I would also recommend this book to the people that like different and odd books. Kafka on the Shore is a book that hypnotizes and leaves a reader attached.